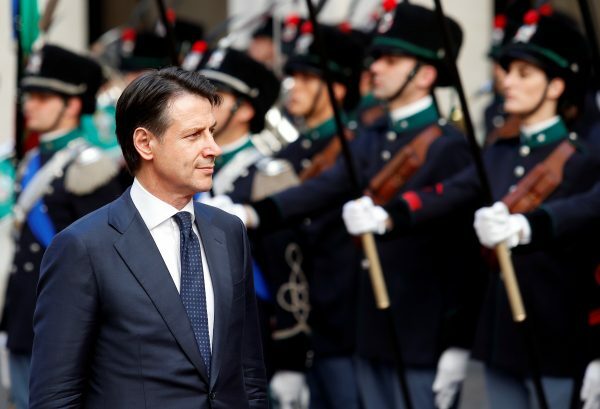 ROME—Giuseppe Conte was sworn in on Friday, June 2, as Italy’s prime minister, heading western Europe’s first anti-establishment government bent on overhauling European Union rules on budgets and immigration. Conte, a little-known 53-year-old law professor, is backed by the 5-Star Movement which grew out of a grassroots protest network, and the right-wing League who together have issued a budget-busting agenda of tax cuts and higher welfare spending. The government was formed after three months of political deadlock following inconclusive March 4 elections, with the former rivals striking a last-minute deal on Thursday to avert a fresh vote in high summer amid growing market turmoil. Conte made no comment to reporters after his swearing-in ceremony in the president’s 16th century palace in Rome, in a room with a huge gilt mirror flanked by Italian and EU flags. “I admit that I am choked up and happy,” League leader Salvini said in a tweet which showed him for once formally dressed with his top shirt button done up for the occasion. 5-Star and the League have a solid majority in both houses of parliament, where the government will face confidence votes early next week in order to be fully empowered. Italy hosted the European Union’s founding Treaty of Rome 60 years ago, but the once enthusiastically pro-EU Italians have progressively become disenchanted with Europe, blaming its fiscal rules for two decades of economic stagnation. The disaffection has grown in recent years as hundreds of thousands of migrants have landed on Italy’s shores from north Africa, fuelling support for the League. 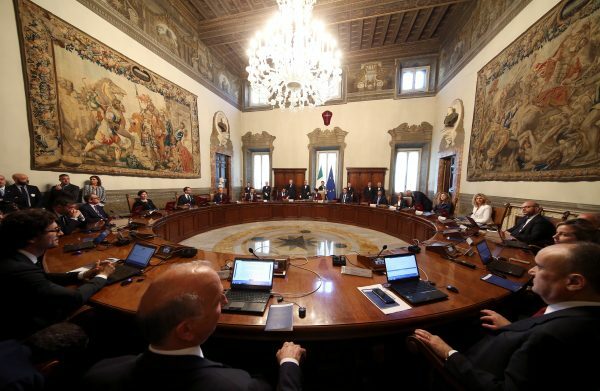 Italy’s future in the euro zone has dominated the political uncertainty of the last week, with President Sergio Mattarella vetoing the coalition’s original choice for economy minister, the eurosceptic economist Paolo Savona. That sparked a breakdown of the coalition’s first attempt to form a government and a furious reaction from the coalition leaders. Savona had advocated a “plan B” to allow Italy to quit the euro if necessary, spooking financial markets. Despite the souring sentiment towards Europe, two opinion polls this week showed between 60 and 72 percent of Italians did not want to abandon the euro. European Council President Donald Tusk congratulated Conte on his appointment. “To overcome our common challenges, we need unity and solidarity more than ever,” he said in a letter. 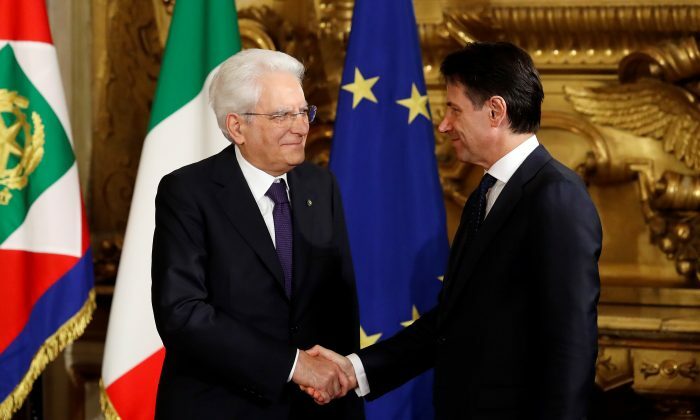 Ironically, after the swearing in at the Quirinale Palace, politicians who early this week were calling for Mattarella’s impeachment were to mingle with him at a reception in its manicured Renaissance gardens to mark the Feast of the Republic. Financial markets, which sold Italian assets heavily early this week, have recovered as the prospect of a snap election receded. Italy’s blue-chip share index close up 1.5 percent on the day and Italian bond yields fell for a third day. Italians exasperated by the weeks of political stalemate were willing to give the coalition a chance. “I hope that this government will start well, we will see, but at least we should put them to the test,” said Rome pensioner Alberto Lapira. Salvini will be the interior minister of the new government and 5-Star leader Luigi Di Maio takes a powerful, newly-created joint ministry made up of the labor and industry portfolios. Both leaders will also be deputy prime ministers and Conte may have a tough time proving he can be more than a puppet in the hands of his powerful political sponsors. Salvini has promised to increase deportations of irregular immigrants and revamp the asylum system, while Di Maio will aim to implement 5-Star’s flagship policy of a guaranteed income of up to 780 euros per month for the poor. While markets were relieved by the end of the political uncertainty, their mood will be tested if the coalition begins to follow through on its expensive policy pledges. Italy, with debts totalling more than 130 percent of its economic output, is the most heavily indebted euro zone nation after Greece and is often described as “too big to fail” as the currency bloc could not bail it out if it were to default. The 81-year-old Savona enters the government as European affairs minister, less powerful that the economy role but one that still allows him to negotiate with Brussels and speak on EU issues. His replacement as economy minister is economics professor Giovanni Tria, a little-known figure who has called for changes to EU budget rules and criticized Germany’s large current account surplus, without suggesting Italy should leave the euro.